with no patient cooperation by unilateral or bilateral molar distalization. Materials and Methods: A retrospective study was conducted to compare the pre-distalization and post-distalization cephalograms and dental model casts of 30 patients (15 male, 15 female) with Class II malocclusion treated with MGBM-System. Mean age at the beginning of treatment was 13.3 years (standard deviation 3.3). Angular, horizontal and vertical measurements were recorded to monitor skeletal and dental-alveolar changes. Molar movements in horizontal plane were monitored by making dental measurements on dental model casts. Results: The MGBM-System produced a rapid molar distalization and Class II relationship was corrected in 8 months ΁ 2.05, on average. The maxillary first molars were distalized of 4.14 (PTV-6 cemento-enamel junction), associated with a significant distal axis incline of 10. 5° referred to SN and a significant intrusion of 1.3 mm (PP). As for anchorage loss, the first premolar exhibited a significant mesial movement of 0.86 mm, associated with a significant mesial axis incline of 2.46°. No significative changes in either sagittal or vertical skeletal relationship were observed. Conclusion: The results suggest that the MGBM-System is an efficient and reliable device for distalizing the maxillary permanent first and second molars. To avoid this negative effect, recent studies have been directed toward the use of dental implants,  miniplates,  miniscrews , as anchorage units in orthodontic patients. Many Authors , had successful results using intraosseus screws for maxillary molar distalization. In 2007, MGBM-System  was introduced as a no-cooperation based system for non-extraction treatment of Class II malocclusions that combines sliding mechanics with the use of miniscrews for anchorage control. The aim of this study was to investigate the efficacy and efficiently of MGBM-System. A retrospective study was designed to evaluate the skeletal and dentoalveolar effects of molar distalization produced by MGBM-System. The sample comprised 30 patients (15 female, 15 male; mean age 13.3 years±3.3) with Class II malocclusion treated with MGBM-System. Gender differences were not considered a factor because of the short duration of MGBM-System treatment. All subjects were consecutively treated with the same protocol in a single orthodontic practice. Absence of cross-bite and agenesy. Good quality diagnostic cephalometric radiographs with corresponding good visualization of landmarks taken at the beginning and immediately after the end of molar distalization. Good quality model dental model casts at the beginning and at the end of distalization. A history of good oral hygiene and no damage to the appliance. No other appliance was used other than MGBM-System during the distalization phase. All patients and parents were informed about the surgical procedure and signed a consent form. The first phase of Class II treatment by MGBM-System involves the distalization of the maxillary molars to an overcorrected Class I relationship. Anchorage is provided by a transpalatal bar, bonded on the occlusal surfaces, of the maxillary first premolars and connected to two palatal miniscrews (Spider Screw,  HDC, Sarcedo, Italy) inserted directly between the first molar and the second premolar. To distalize the first molar before the eruption of the second molar, we use a sectional SS wire extended from the first premolar to the first molar and a compressed 200 g Sentalloy coil spring activated of 10 mm. When the second molars are erupted, the simultaneous upper molar distalizing system was applied. It consists of two different distalizing components: One activated against the first molar as previously described and the other against the second molar. A double tube is inserted onto the SS wire through the lower tube and positioned to abut the premolar bracket. The tube is blocked by the compressed coil against the premolar bracket. The second distalizing component is a shape memory. 018 × 025" SS Nickel Titanium wire 160 g of force featuring an excess of length and crimped mesial and distal stops extending from the second molar, looped vertically for 6 mm in the buccal fold and inserted into the upper tube of the double tube on the sectional wire. As the wire assumes its normal horizontal orientation, it places the distal force on the second molars [Figure 1]. After attaining an overcorrected Class I molar relationship, the palatal miniscrews and the transpalatal bar are removed and 2 miniscrews are placed in the buccal site mesial to the first molars, perpendicular or oblique to the cortical bone to allow premolars, canine and incisors retraction by sliding mechanics with 150 g nickel titanium coil. After the first premolars have attained a Class I position the last phase of treatment is the retraction of the incisors by means of sliding mechanics. Lateral cephalograms and dental model casts were taken at the beginning of treatment with the MGBM-System (T0) and the end of molar distalization (T1). The cephalograms were taken with two different X-ray equipments. Because the radiographic magnification factor was similar, no correction was necessary. Angular, horizontal and vertical changes were recorded to monitor skeletal and dental-alveolar changes. The soft-tissue and skeletal measurements are shown in and dental measurements in [Figure 2]a and b. Centroid points were constructed for the crowns of the maxillary first and second molars and premolars as the midpoint between the greatest mesial and distal convexity of the crowns of these teeth as seen on the cephalometric radiograph. Ghosh and Nanda  cephalometric analysis was used to assess dentoskeletal effects. Distal movement and distal tipping of maxillary first permanent molars. Anchorage loss, i.e., anterior movement of maxillary central incisors. Dental changes of upper molars in the horizontal plane. Molars movement in the horizontal plane was monitored by taking alginate impressions and making dental model casts both at the beginning of therapy (T0) and at the end of distalization phase (T1). Manual calipers were used to determine the changes in the molar region by measuring the pairs of dental model casts. The measurements were to identify in each patient any increase or decrease in transverse arch width in the region of the first, second molars and first premolars as well as the magnitude and mode of molar rotation achieved by the therapy. [Figure 3] and [Figure 4] show the different measurements considered for each subject. The angles between the straight line transversing the mesiobuccal and distobuccal cusp tips and the raphe-median line were also measured. Descriptive statistics (mean, standard deviation (SD)) were calculated for each cephalometric and dental model cast measurement at T0 and T1. The non-parametric Mann-Whitney Test was used to analyze the differences between paired pre-treatment and post-treatment variables (level of significance P>0.05). To assess the error of location of the reference points all tracings were traced by an investigator (L.M.) and verified by another (G.M.) casual errors were assessed by using Dahlberg's  formula and systematic errors were ascertained by using paired t tests. No statistically significant error was detected for any cephalometric and dental casts measurement (Student paired t-test, level of significance P>0.05). Statistical analysis was performed using MedCalc software version 11.1.1.0, Mariakerke, Belgium. 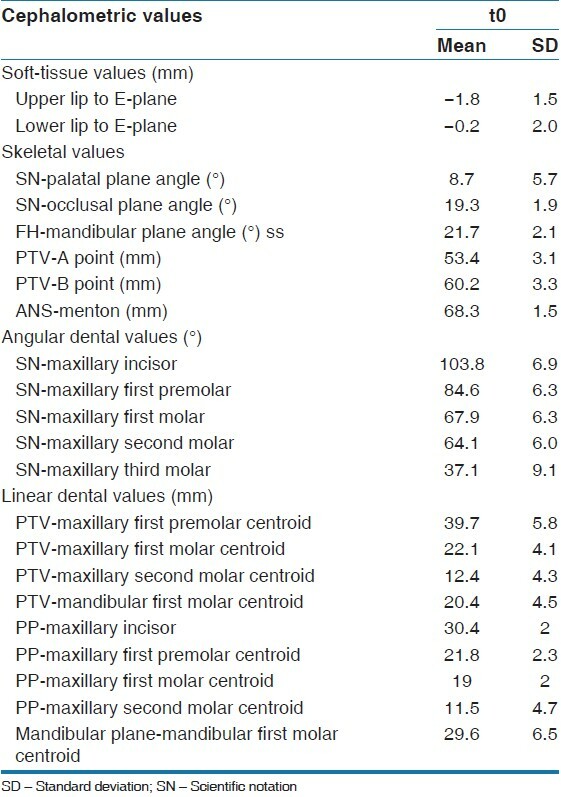 Pre-treatment cephalometric values and dental model cast values are given in [Table 1] and [Table 2] respectively. Maxillary molars were distalized successfully to Class I relationships without patient cooperation in all cases in 8, 2 months time. Cephalometric analysis showed no remarkable growth between the 2 measurement times. 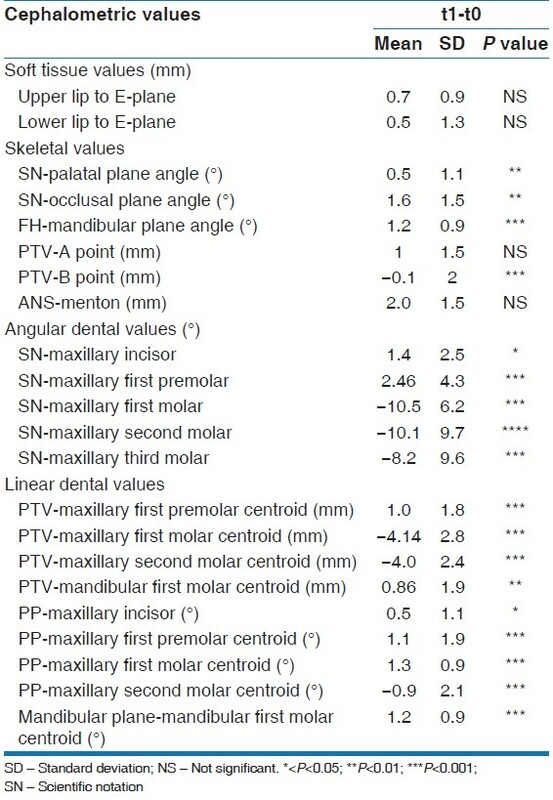 Mean values and SDs values of skeletal aesthetic and dental changes as shown by cephalometric analysis are given in [Table 3]. Upper molar distalization was achieved in 8±2.05 months; showed significant mean values 4.14±2.8 mm (PTV-6 cemento-enamel junction (CEJ)). The distal movement of the second upper molar is similar to that of the first molar 4.0±2.4 mm (PTV-7 CEJ). 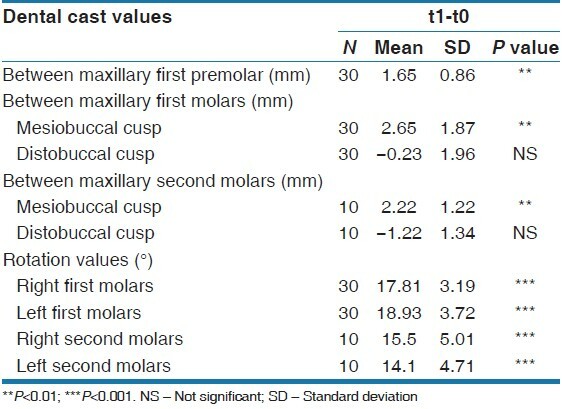 The first maxillary molar crowns tipped distally average amounts of 10.5±6.2° (SN). Moreover, upper first molars also significantly extruded 1.3±0.9 mm referred to PP. A significant mesial movement of the first premolars (anchorage loss) of 1.0 mm associated with a significant mesial axial incline of 1.1° was recorded. In the anterior region the maxillay incisors tipped mesially average amounts of 0.5±1.1° (PP). Distalization of maxillary molars with MGBM-System yielded also a clockwise rotation of the occlusal and mandibular planes. No statistically significant changes occurred in the soft-tissue measurements during distalization therapy. 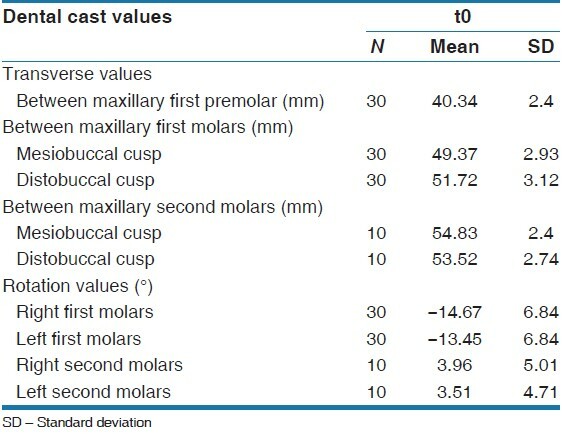 Dental changes in the horizontal plane shown by dental model casts measurements are given in [Table 4]. The gain in transverse arch width in the first molar region between the mesiobuccal cusp tips and the distobuccal cusp tips (mean values of 2,65 mm±1.87 mm, −0.23±1.96 mm, respectively) proves both expansion and mesiobuccal rotation occurred in the first molar region. The mean mesio-buccal rotations of the first molars were 17.81±3.19° and 18.93±3.72°, respectively. The second molars are also significant rotated at the end of distalization (P<0.001). A 13-year-old boy presented for treatment in the permanent dentition stage [Figure 5]a-g. Patient showed a bilateral Class II molar relationship. There was no transverse discrepancy. No signs or symptoms of temporomandibular joint problems were observed. There was a significant crowding in the upper arch with a severe irregularity index. Panoramic radiographs showed the presence of all of the teeth included the lower and upper wisdom teeth. Patient had an SNA angle of 81°, an SNB angle of 78° and an ANB angle of 3°. 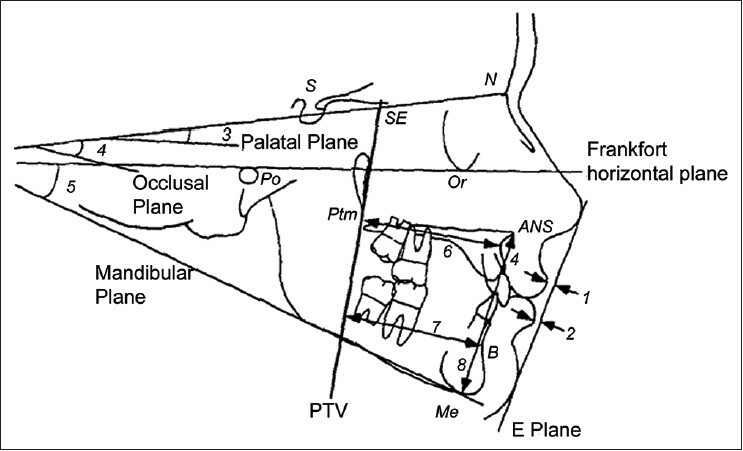 The mandibular plane (Sn-GoMe) angle was 35° , the lower incisors had a 92° angle relative to the mandibular plane and the upper incisors had a 105° angle relative to the palatal plane. Patient and his family choose the non-extraction alternative and a distal movement of the upper first and second molar was planned. The treatment objectives included achieving a Class I molar relationship with distalization of both upper first and second molars. We used MGBM-System as described above. In the initial phase of distalization, we applied light forces that do not interfere with the stabilization of the palatal miniscrews. We started the simultaneous distalization with a 160 g Neo Sentalloy wire and a superelastic coil of 100 g. After 2 months, the coil was replaced with one of 200 g.
After a treatment period of 5 months, the first and second maxillary molars had been moved 5 mm distally and at the end of distalization phase we achieved an overcorrected bilateral Class I molar relationship [Figure 6] a-c. The palatal miniscrews and the transpalatal bar were removed and 2 miniscrews (K1, 10 mm) are placed in the buccal site mesial to the first molars, perpendicular to the cortical bone [Figure 7] a-c. The miniscrews were placed low in the attached gingival because was not necessary to intrude the incisor segment. We immediately applied 50-100 g using elastic stretched from the miniscrews to retract the premolars and canines at the same time. After the first 2 months, during which time we could judge the trustworthiness of the miniscrews, we increased the elastic force. After the first premolars and canines have attained a Class I position, the retraction of the incisors by means of sliding mechanics started [Figure 8] a-c.
At the end of the treatment an ideal Class I molar and canine relationship, an ideal overbite, and an ideal overjet were all achieved [Figure 9] a-g.
MGBM-system is an orthodontic device reinforced with temporary skeletal anchorage recently proposed for the upper first and second molars distalization. This retrospective study reported the results of 30 patients with Class II bilateral malocclusion treated with MGBM-System. Maxillary molars were distalized successfully to Class I relationships without patient cooperation in all cases. The amounts of molar distalization were 4.9 mm with MGBM-System after 8 months. These results agree with those of Fudaley's and Antoszewska  review about orthodontic distalizers reinforced with TAD's, which reported values ranged from 3.5 to 6.4 mm. Ideal distalization appliances should provide a bodily distal displacement of the molar. Depending on the device used, the amount of molar tipping shows a great variability: Antonarakis and Kiliaridis  reported values of distal tipping of 8.3° for devices with vestibular application of force versus 3.6° of the devices with palatal force application system. In our study, the maxillary first molars were tipped distally 10.5 (SD 6.2)°. In MGBM-System patients distal and reaction force vectors are located lower in respect to the molar center of resistance and consequently the distal movement of molars occurs with a distal tipping of the teeth. Furthermore, the germinating stage of the second molar can influence the molar tipping. According to Kinzinger et al. 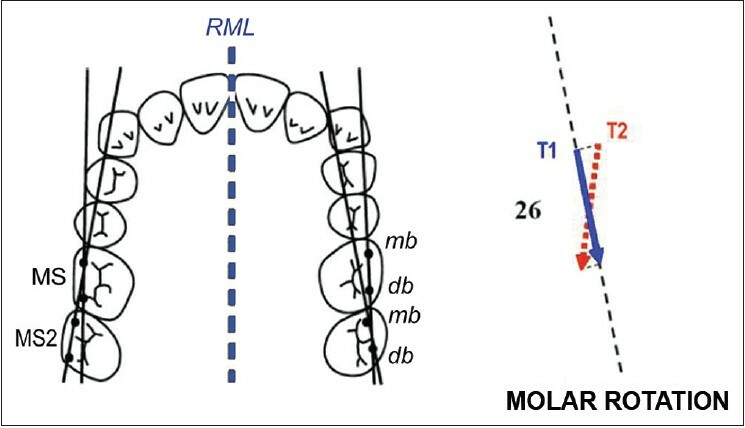 in this study, 20 on 30 patients presented second molars erupting and this could explain the quite hight range of molar tipping. The skeletal anchorage of MGBM protocol does not completely eliminate the loss of anterior anchorage. A clinical light but statistically significant anchorage loss caused by maxillary molar distalization is found expressed by the mesial movement of the premolar-incisor segment. A possible explanation of this side-effect could be the elasticity and reduced stiffness of the transpalatal bar and metal ligatures. Wire ligatures 0.012 "SS connecting the miniscrew to the transpalatal bar, are elastic and flexible as well as the transpalatal bar is flexible and deformable. Moreover, as reported by Kinzinger et al. 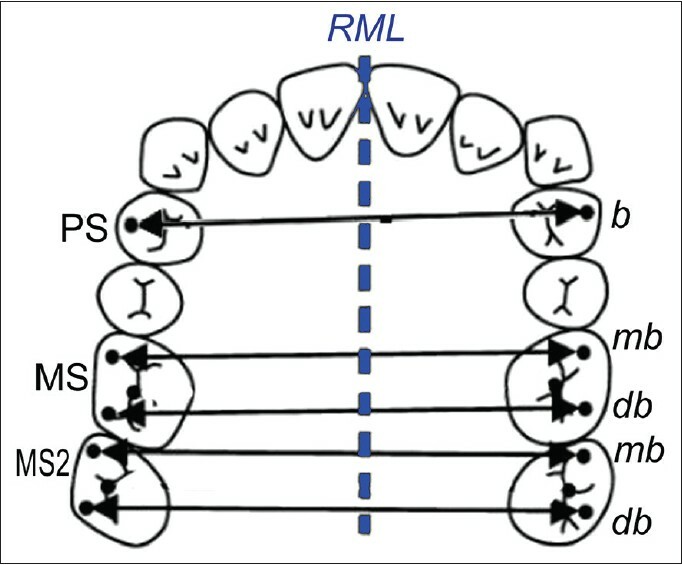 and Liou et al.,  palatal miniscrews may show small movements when stressed by orthodontic forces. These indesiderable movements would occur due to the absence of osseointegration and to the elasticity of the bone. Another cause of the unexpected loss of anterior anchorage could be the distance between the buccal force application and the tooth center of resistance. Antonarakis and Kiliaridis  in his review, showed that distalizer with palatal application of forces behaved less with anchorage loss and therefore a reduced anterior movement of the premolars (1.3 mm vs. 2 mm) compared to the vestibular system. Analysis of the dental model casts reveals that a therapeutically desirable transversal expansion of the dental arch had occurred both in first and in second upper molars region. Moreover, the first molars developed a distal rotation of the buccal cusps during distal movement. This rotation is useful in the correction of mesially rotated molars. In fact most subjects with a Class II malocclusion show maxillary first molars rotated mesially around the palatal root. The results of this study have shown that the MGBM-System is an effective and efficient method for distalizing maxillary molars and this treatment requires minimal patient compliance. The use of transpalatal bar reinforced by two palatal miniscrews provides sufficient anchorage to distalize simultaneously first and second molars. A small amount of anchorage loss should be expected although the use of skeletal anchorage. 1. Haas AJ. Headgear therapy: The most efficient way to distalize molars. Semin Orthod 2000;6:79-90. 2. Cetlin NM, Ten Hoeve A. Nonextraction treatment. J Clin Orthod 1983;17:396-413. 3. Carano A, Testa M. The distal jet for upper molar distalization. J Clin Orthod 1996;30:374-80. 4. Carano A, Testa M, Bowman SJ. The distal jet simplified and updated. J Clin Orthod 2002;36:586-90. 5. Jones RD, White JM. Rapid Class II molar correction with an open-coil jig. J Clin Orthod 1992;26:661-4. 6. Hilgers JJ. The pendulum appliance for Class II non-compliance therapy. J Clin Orthod 1992;26:706-14. 7. Gianelly AA, Vaitas AS, Thomas WM, Berger DG. Distalization of molars with repelling magnets. J Clin Orthod 1988;22:40-4. 8. Fontana M, Cozzani M, Caprioglio A. Non-compliance maxillary molar distalizing appliances: An overview of the last decade. Prog Orthod 2012;13:173-84. 9. Roberts WE, Nelson CL, Goodacre CJ. Rigid implant anchorage to close a mandibular first molar extraction site. J Clin Orthod 1994;28:693-704. 10. Choi BH, Zhu SJ, Kim YH. A clinical evaluation of titanium miniplates as anchors for orthodontic treatment. Am J Orthod Dentofacial Orthop 2005;128:382-4. 11. Polat-Ozsoy O, Kircelli BH, Arman-Ozçirpici A, Pektaº ZO, Uçkan S. Pendulum appliances with 2 anchorage designs: Conventional anchorage vs bone anchorage. Am J Orthod Dentofacial Orthop 2008;133:339.e9-33917. 12. Kinzinger G, Gülden N, Yildizhan F, Hermanns-Sachweh B, Diedrich P. Anchorage efficacy of palatally-inserted miniscrews in molar distalization with a periodontally/miniscrew-anchored distal jet. J Orofac Orthop 2008;69:110-20. 13. Kinzinger GS, Gülden N, Yildizhan F, Diedrich PR. Efficiency of a skeletonized distal jet appliance supported by miniscrew anchorage for noncompliance maxillary molar distalization. Am J Orthod Dentofacial Orthop 2009;136:578-86. 14. Oberti G, Villegas C, Ealo M, Palacio JC, Baccetti T. Maxillary molar distalization with the dual-force distalizer supported by mini-implants: A clinical study. Am J Orthod Dentofacial Orthop 2009;135:282.e1-5. 15. Maino BG, Gianelly AA, Bednar J, Mura P, Maino G. MGBM system: New protocol for class II non extraction treatment without cooperation. Prog Orthod 2007;8:130-43. 16. Maino BG, Bednar J, Pagin P, Mura P. The spider screw for skeletal anchorage. J Clin Orthod 2003;37:90-7. 17. Ghosh J, Nanda RS. Evaluation of an intraoral maxillary molar distalization technique. Am J Orthod Dentofacial Orthop 1996;110:639-46. 18. Dahlberg G. Statistical Methods for Medical and Biological Students. London, United Kingdom: Allen and Unwin; 1940. p. 122-32. 19. Gelgör IE, Büyükyilmaz T, Karaman AI, Dolanmaz D, Kalayci A. Intraosseous screw-supported upper molar distalization. Angle Orthod 2004;74:838-50. 20. Fudalej P, Antoszewska J. Are orthodontic distalizers reinforced with the temporary skeletal anchorage devices effective? Am J Orthod Dentofacial Orthop 2011;139:722-9. 21. Antonarakis GS, Kiliaridis S. Maxillary molar distalization with noncompliance intramaxillary appliances in Class II malocclusion. A systematic review. Angle Orthod 2008;78:1133-40. 22. Kinzinger GS, Fritz UB, Sander FG, Diedrich PR. Efficiency of a pendulum appliance for molar distalization related to second and third molar eruption stage. Am J Orthod Dentofacial Orthop 2004;125:8-23. 23. Liou EJ, Pai BC, Lin JC. Do miniscrews remain stationary under orthodontic forces? Am J Orthod Dentofacial Orthop 2004;126:42-7.